With this business rule, you can set up a schedule and create new cards automatically. For example, you can configure the system to automatically create new cards with predefined parameters, every Monday at 5 pm. This rule is very useful when you have recurring tasks, e.g. How to set up the rule? Only users with "Account Owners" or "Manage Business Rules" privileges can create business rules. 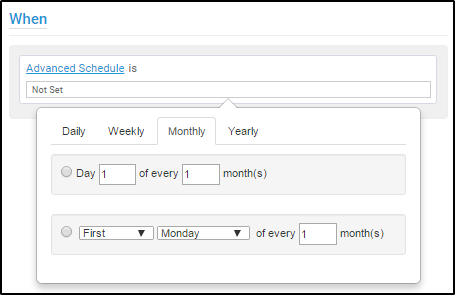 Go to your Administration panel at the top right of your screen -> open the Business Rules tab -> select the Recurring create cards rule tab. Note: In case there is a set of defined rules to your account -> use the Add new rule button at the upper right side of the panel. In the Name and Description fields, you can change the name of the rule and describe the scenario you will achieve with it. This way you can create an overview of your active business rules, as upon creation every automation is present in the Business Rules panel. You can share the rule with other users (e.g. with a Workspace Manager of a board), if appropriate. In this case, they will be able to edit/disable/enable the rule. The Business Rules are a sort of "point-and-click" programming language with which you can automate any process. Each Business Rule has three main properties: When; And; Then. 1. WHEN - here you define a schedule for the automatic card creation. Click on Every Day -> select one option -> click on Change. Practical tip: The Advanced Schedule gives you options like "every x day of the week", "every first/second/third/fourth Monday of every x month", "every June in day x", etc. Click on Not Set to configure the advanced schedule. 2. AND - no filters are applicable for this rule. 3. THEN - Select the execution time and the position/details of the card to be created. Execute At: Click on the time and select an hour between 00:00 and 23:00. The timezone set for your account is displayed. Note: It is important for the execution of the rule to set up your correct time zone in My Account. 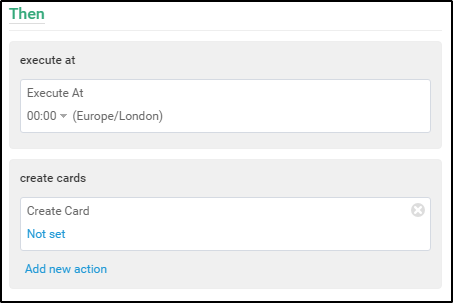 Create cards: Click on Add new action -> click on Not set -> Select the board where the card should be created and choose its position (column and swimlane) from the board minimap. An empty card will open, this is the card which will be created by the business rule. -> Enter a card title, which is obligatory -> define the card fields of your choice -> click on Save details. Click on Add new action to create extra cards and optimize the scope of the rule. Click on the x-sign at the top right of an action to remove it. How to Enable the rule? To enable the rule -> click on the green check mark at the top right corner of the configuration panel. Click on the red x-sign to cancel the creation of the rule.